I'd noticed the top of the rear license plate holder was a bit rusty, so I decided to remove it for a clean-up and fresh coat of paint. The plate is held on by the two nuts through the license plate itself, padded by two rubber spacers behind the holder and secured by nuts accessed from inside the boot. 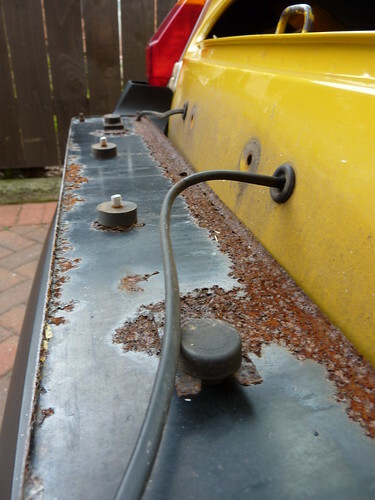 The license plate lights are fed from wires, through holes either side of these screws, connected to the harness via bullet connectors inside the boot. it's a pretty simple job to undo the screws, release the bullet connectors and detach the plate and wiring from the rear of the car. Unfortunately the holder was more rusty than I'd thought - thanks it seems to the rubber bumper allowing water to sit at the bottom of the plate. As soon as I started cleaning it up, much of the bottom edge disintegrated. So I'll have to order a replacement, which luckily is cheap. In the meantime I gave the old one a clean with a wire brush and some wet-and-dry paper and a coat of Hammerite gloss black paint, so at least now it looks better. It also gave us the opportunity to give the paintwork behind the license plate a clean and polish.